Form OW-8-ESC is a Oklahoma Tax Commission form also known as the "Estimated Tax Declaration For Corporations And Trusts". The latest edition of the form was released in May 1, 2017 and is available for digital filing. 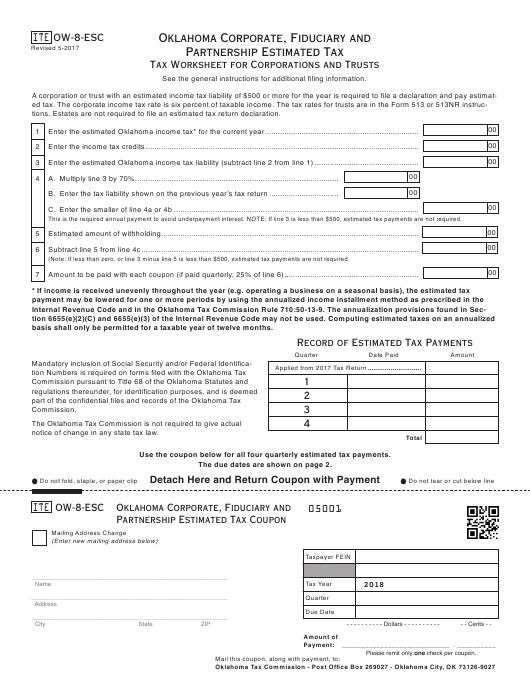 Download a PDF version of the Form OW-8-ESC down below or find it on Oklahoma Tax Commission Forms website. tions. Estates	are	not	required	to	file	an	estimated	tax	return	declaration. This is the required annual payment to avoid underpayment interest. NOTE: If line 3 is less than $500, estimated tax payments are not required. (Note: If less than zero, or line 3 minus line 5 is less than $500, estimated tax payments are not required. basis shall only be permitted for a taxable year of twelve months. notice of change in any state tax law. Use the coupon below for all four quarterly estimated tax payments. The due dates are shown on page 2.
tions. Corporate income tax is six percent of taxable income. Name and Address: Enter the name and mailing address. Taxpayer FEIN:	Enter	the	Federal	identification	number. Quarter: Enter the quarter for this estimated payment. return is less than $1,000. For additional information see 68 O.S. Audit Section at (405) 521-3126.
payments. The quarterly due dates are shown below.